Bring home all the comforts of a personal masseuse with the Pegasus 2 Smart. With advanced technology and special therapeutic features this chair delivers the best full body massage therapy. For a truly relaxing massage experience, turn oﬀ the lights! Pegasus 2 Smart includes a color-changing ambient lights thanks to seven-color low-energy lights tucked discreetly into the base. Soothing lighting completes the full-body, multi-sensory massage experience. Named after the mythical winged stallion, the Daiwa Pegasus 2 Smart can also expand its “wings” to insure a comfortable experience for users of all sizes. The width extends from 26 inches to 32 inches for people with a larger stature. 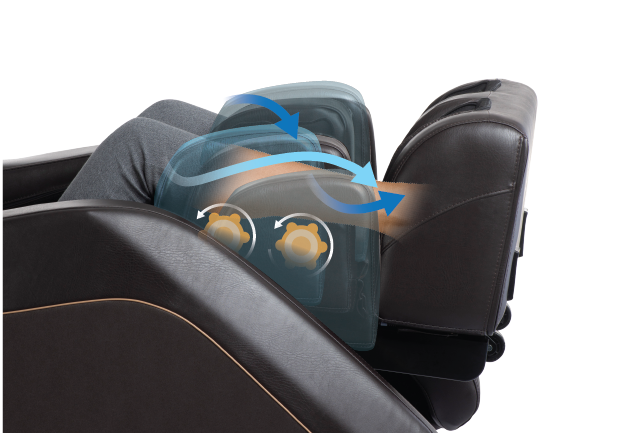 The Pegasus 2 Smart's gliding recline mechanism takes up much less space, allowing the entire chair to fully recline when placed just 0.25” from any wall. The Pegasus 2 Smart has the most technologically advanced leg massager, thanks to an upgraded design that applies Shiatsu rollers to the back of the calves. A series of airbags wrap around the feet and calves rhythmically expand and contract, using pressure to squeeze sore muscles. And at the same time, they move up-and-down and rotate in a circle, so that tired calves are thoroughly massaged on all sides. The Pegasus 2 Smart features our next-generation 3D Massage Rollers. By moving in multiple directions, the rollers are designed on an extra plane of movement that allows them to follow the natural contours of your body. Select up to 5 intensity levesl for the ultimate full-body massage. An extra-long, L-Shaped Massage Track runs from the top of the shoulders to the upper thighs. The 3D SmartScan maps your entire back before each massage in order to provide a custom experienced that is contoured to your spine. The Pegasus 2 Smart gently rocks back and forth to generate the feel of classic rocking chair, which reduces anxiety and helps you to have a more restful sleep.You can enjoy this feature as an option with any of the massage functions, or enjoy it on its own as a way to relax or to take a nap. The Zero Gravity Recline shifts the recline angle, evenly distributing body weight and reducing pressure on joints and organs. You'll experience a floating sensation that over time reduces chronic pain. Built into the chair are 48 airbags that rhythmically inﬂate and deﬂate during your massage session. Powerful airbags inﬂate and deﬂate in an alternating pattern around the calves and the feet to relieve tension and improve circulation, while built-in grips gently hold your ankles in place. The leg unit automatically extends out up to 5.5 inches for taller people. Based on the principles of reflexology, our foot rollers activate nerve endings on the feet to relieve tension, improve circulation, and renew vitality. Our three different foot rollers target the specific needs of the feet. The saffiano style was developed by luxury handbag makers to give the leather surface a crosshatched texture that is stylish, durable, and easy to keep clean. 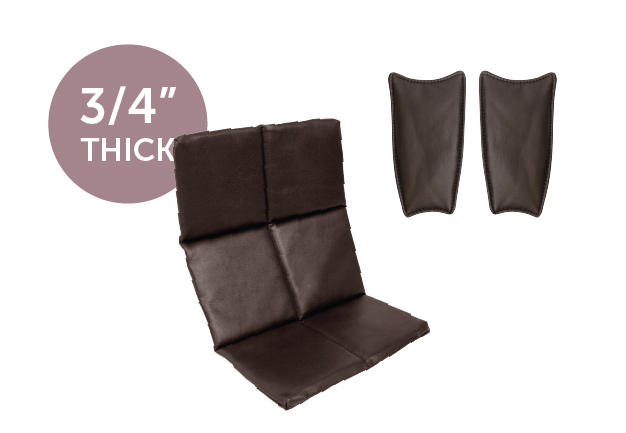 The 3/4-inch-thick soft chair pad allows you to enjoy the chair as a recliner without any massage treatment. 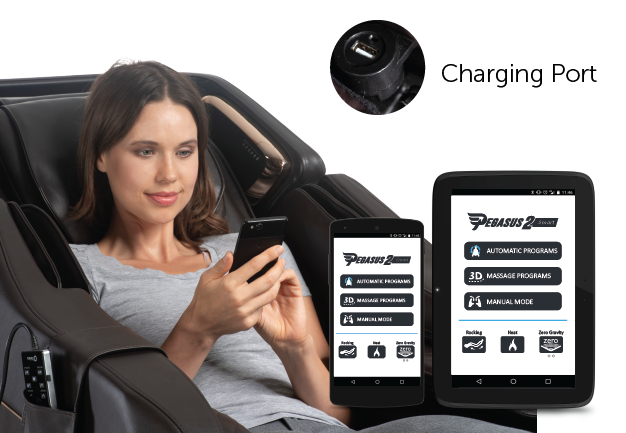 The Daiwa Pegasus 2 Smart Massage Chair App connects wirelessly to your Solace chair using Bluetooth. Use the app to access the controls, including activating manual and automatic massage programs, targeting massage to different parts of your body, or varying the massage type and intensity. Keep your devices charged with Solace's convenient USB charging port. Choose from 27 auto programs* or 9 customizable manual programs with the easy-to-operate handheld remote. A convenient pocket keeps your controller secure and in reach. Remote includes a wide selection of languages such as: English, Spanish, Chinese (Traditional), Chinese (Simplified), Korean, Japanese, and Vietnamese.